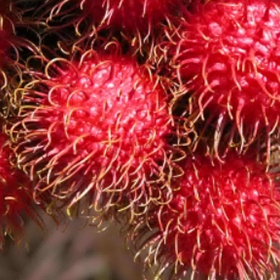 Rambutan's nutritional information pertains specifically to the rambutan grown in Puerto Rico. Other regions of the world where this fruit is grown have differences in soils, climate, fertilizer, irrigation water and rain chemistry, humidity, wind, and the amount and intensity of sunlight--all of which may have a significant impact on the nutritional values posted below. We mention this because these nutritional values may not be the same outside of Puerto Rico. For that matter, even within Puerto Rico, there are so many microclimates, soil types, and pH variations. 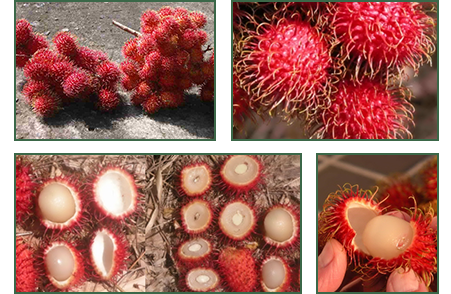 These results may be viewed only as an example of the nutritional profile of just one of the island's rambutan fruit growers. And then, there is the seasonal variation from one crop to the next. The test results included herein were from a particularly good summer crop, and there should be some variability of these values each season. Generally speaking, however, the vitamin content and minerals found on this page should help people with concerns about the nutritional value of the rambutan. This fruit tastes great and it is good for you as well! Specific attention is drawn to the sugar content in this sample because the level is high. This may have resulted from water loss before testing, which might have raised the concentration of sugar somewhat. This is possibly a more accurate reflection of how the rambutan is when you find it in a store. From the tree to the table, usually a few days have elapsed. 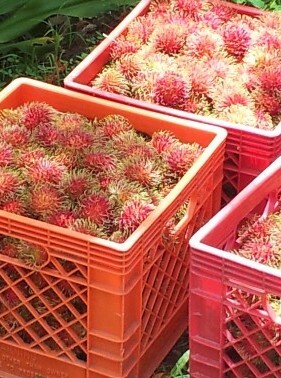 During this time, the water loss from the rind of the rambutan is a steady process. The values above show that the rambutan is a valuable contributor to your daily nutritional needs. The calcium, magnesium, and potassium are all important essential elements in a balanced diet. The acidity or pH of 4.66 combines with the relatively high sugar levels to give the fruit great intensity of flavor. This is a natural sweet and sour effect, as the acids play against the sugars to great effect.